The village of Sedlari is situated ca. 4 km to the west of the town of Momchilgrad in the Eastern Rhodope Mountains. The archaeological excavations on the terrace above the Varbitsa River, a tributary of Arda River, have been carried out for almost 35 years with several interruptions. The archaeological deposits reach ca. 3 m at some places. The multilayered site yielded a large amount of pottery dated back to the Early Byzantine and Medieval periods. The pottery assemblage is divided into groups based on dates and technology. The first group comprises handmade pottery sherds. Some of them are dated back to the 4th – 5th century and belong to ware whose shapes and decoration illustrate earlier traditions. The publications on this pottery are scarce although a number of specialists have reported sites yielding such ware. Handmade pottery dated back to the 6th century but completely different from the one described above is also part of this group. This pottery is related to the early Slavic traditions and comprises jars and podnitsi (ceramic dishes for baking bread). Special attention is paid to the talc used for the clay tempering. The tradition has lasted for centuries, but it is considered typical only for the Rhodopes. The second group consists of a large amount of pottery. It comprises Late Antique thrown ware. The shapes include jars, handled jars, bowls and amphorae. 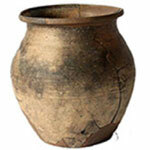 The third group consists of pottery dated back to the second half of the 11th and 12th century. It comprises relatively small amount of sherds. It is related to the large Christian cemetery and the ritual pits excavated within its boundaries. Based on the pottery analysis, an attempt is made to reconstruct the life of the people on the river terrace in the Late Antiquity and the medieval period.